As an interior design practice we firmly believe that a schemes style should capture the inner personality and character of our individual clients, reflecting accurately their unique traits, interests and qualities. A home should be a haven of comfort and relaxation, particularly within the bedroom; a space which should always be a designated destination to calm, comfort and restore. 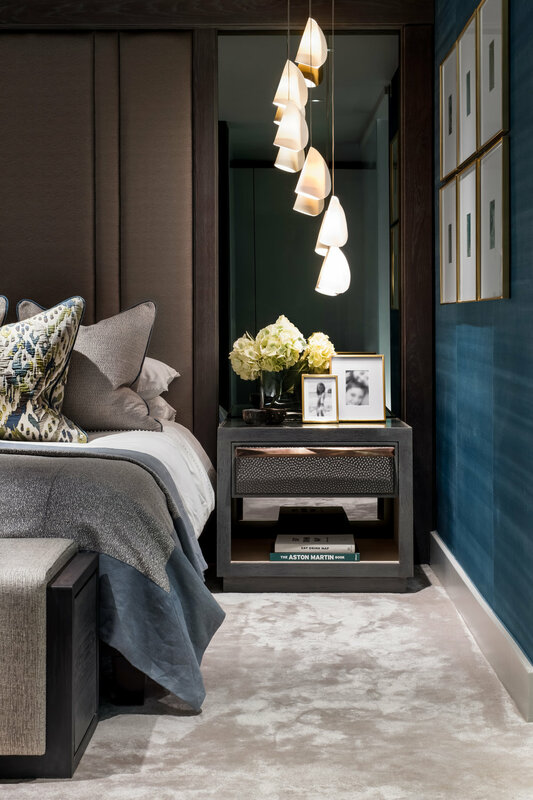 The design brief set by our client acknowledged these needs of calmness and relaxation, requiring our design team to fully embrace the wealth of space within the open-plan master bedroom suite, mindfully unifying each individual element. Our studio teams considered arrangement reflected how the client wished to interact within the space on a functional level, whilst aligning visually the clients own sensory reactions - resulting in a luxury master bedroom design which bonds emotive values with the high-end prestige of the property itself. The most integral aspect within the space, the sleeping area, combines a selection of various complementary textures layered within close proximity to one another; creating depth and warmth as the surrounding light bounces from each unique textured surface - in a combination ways. The tactile elements were extended throughout the entire area, the immediate interaction points incorporating soft-to-touch fabrics leading to a bespoke-designed upholstered headboard - visually a stylish backdrop but with comfort at the forefront of the design, allowing the client to sit up in bed physically at ease and able to fully relax. Strong features were required throughout the expansive space to clearly define each individual area. The introduction of strong sculptural lighting at the bedsides by the iconic brand Bocci not only created a unique point of interest but allowed the bespoke side tables to be free for their intended function and purpose. The considered application of smoked mirror reflecting the sculptural lighting from behind enhanced the pieces further, drawing the eye around the room to unify the area with the overall luxurious space. To provide a sense of personality within space our Design Director, Claire West, personally commissioned artworks by abstract artist Rebecca Morris. Working from her studio in the Cotswolds, Morris works on canvas, boldly layering paint fluidly and intuitively, creating washes and stains which are later enhanced and deepened - resulting in pieces with a distinct mood and a sense of place. Whilst each piece incorporates the artists unique techniques, every artwork Morris creates is an original; personal to each individual client. Throughout the space the client required functional storage but also areas to display a carefully curated selection of objects, mementos and personal photographs. We designed these areas acknowledging the need for individual pieces to sit together cohesively whilst also recognising the need to maintain a feeling of consistency throughout the space as a whole. Carefully selected, high-quality bespoke finishes were hand crafted for each individual element, built with form and function in mind - to truly last a lifetime. 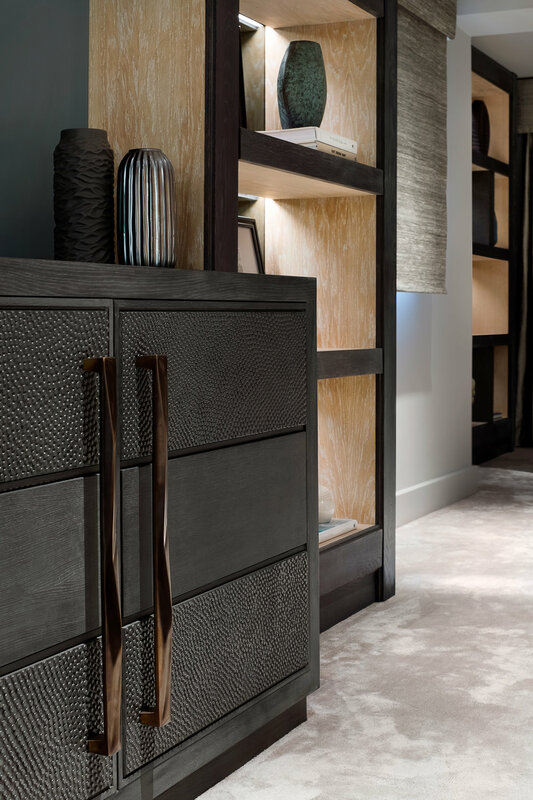 A bespoke approach allowed us the freedom to design beautiful and intricate cabinetry, aesthetically streamlined to allow the client to showcase their own personal objects. Utilising the full space, a dedicated seating area was incorporated as a key component for tranquility and relaxation, provided as a necessary space to read and relax in a calm and considered surrounding. 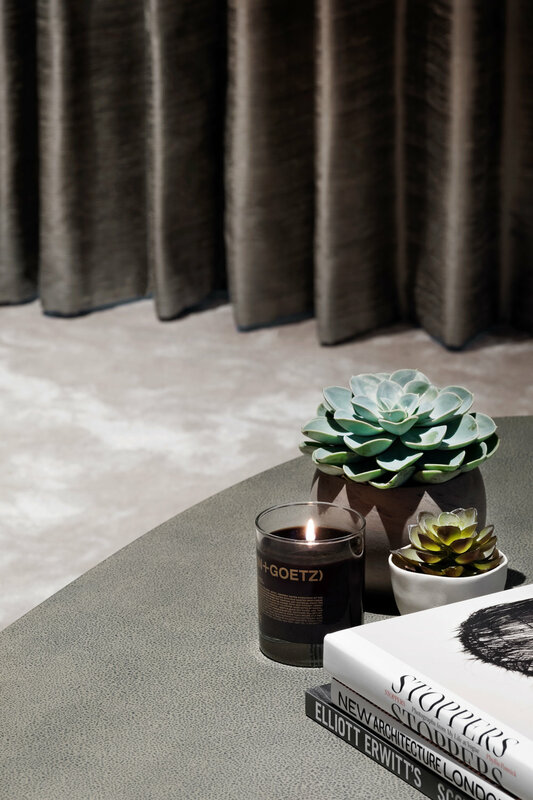 Scents by Malin and Goetz provided fresh notes of oak-moss, sandalwood, amber and patchouli, providing the holistic experience of a relaxing atmosphere. The luxurious colour palette for the space delicately combined hues located within the middle of the colour spectrum with carefully composed shades, green in particular, selected to create a restorative, balanced and harmonious setting.